Whether it’s Friendship’s Day or you just want to remind your friends how special they are to you, there is no better way to convey your feelings than by giving them a collage of all your great times together. From your school memories to the last trip you took together, you can create a stunning collage in just a few minutes, all thanks to Canva. 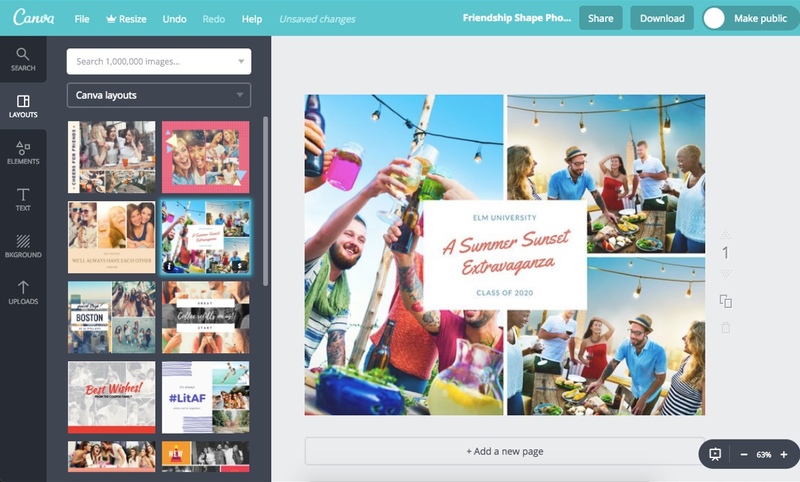 Canva has several collage templates which make it easy for you to create a collage for your friends. With drag and drop tools and an easy to understand interface, you need no prior designing experience to create collages on Canva. All you have to do is, upload your favorite pictures, drag them to the collage templates, and you are done! Create a new Canva account to get started with your own Friends Collage designs. Start by collecting all your favorite pictures of you and your friends together. Whether you just had a great dinner with them or you have a picture from the first time you met, choose the best ones for your collage. Canva already has a number of collage layouts that you can select, based on your vision and the number of pictures that you want to add. With your collage layout picked out, upload images from your computer by clicking on the green ‘Upload your own images.’ Pictures once uploaded on Canva, stay saved in your account, and you can use them in multiple collages. You can also crop the uploaded pictures or add filters to them. In case you want to add more fun elements to your photo collage, you can use Canva’s media library which has over a million images, graphics, and illustrations. Most of these are free, while only a few cost $1 for each one-time use. While making a collage, it can be easy to get confused when it comes to deciding which pictures to add. If you too are confused, then why not get feedback from your other friends? After all, feedback from a fresh set of eyes can go a long way. Share your collage design with your friends by clicking on the share button and adding the email addresses of your friends. If you want your friends to make changes to the collage, then click on the ‘can edit’ box. Otherwise, click on the ‘can comment’ box. If you want to gift the collage to your friend, you can get a print of the design by downloading it in the PDF-Print format. With the specialized Print option, you get a 300 DPI (Dots Per Inch) print with vibrant pictures and absolutely no blur or pixelation. You can either gift the collage as a poster or get it framed. Declare your love for your friends on social media by directly sharing the image on Facebook or Twitter. You can also download the image in JPG or PNG format to either share it on Instagram or send it to your friends via messaging apps like WhatsApp or Viber. To access Canva, just type in www.canva.com on your web browser and create an account to get started. You can also download the Canva app on your iPad or iPhone from the App Store. Can I add a small message to the collage? Absolutely! Canva has several pre-designed font combinations and typography that you can use to add a heartfelt message to the collage. You can also use 130 fresh fonts to create your own font combination. Can I re-edit the collage design later? Why not? All the designs you create on Canva get saved automatically, and you can access them anytime from your account homepage. Just click on the design you want to edit, make changes, and download it again!